Restless legs syndrome is a common condition that causes significant sleep loss in some people. Vitamin D deficiency is often responsible for aggravating the condition. Restless legs syndrome is twice as common in women as men and is more prevalent as people get older. Some women develop the condition in the last trimester of pregnancy. Restless legs syndrome basically means twitching, throbbing, jerking type sensations in the legs at night, waking the sufferer or preventing them from being able to get to sleep in the first place. There may also be cramping and a general sensation of restlessness or tightness in the legs. These unpleasant feelings may be reduced by shaking or stretching the legs or getting up and walking around the house at night. The condition is a major cause of insomnia and daytime fatigue. Being low in vitamin D raises the risk and it is something your doctor may not have considered. One cause of restless legs syndrome is impaired dopamine signalling. This is why the conventional treatment is with dopamine agonists (drugs that bind to and activate dopamine receptors). Unfortunately, these drugs can become less effective in time, and can even cause a worsening of symptoms. Recent research has shown that vitamin D increases levels of dopamine and its metabolites in the brain, and protects dopamine-associated neurons from toxins. A study titled The effect of vitamin D supplements on the severity of restless legs syndrome was published in the medical journal Sleep & Breathing. The study recruited 12 adults with primary restless legs syndrome and vitamin D deficiency. All of the study participants initially had a blood vitamin D level less than 20ng/mL. The average blood level was 9ng/mL. They were given vitamin D supplementation to bring their blood level above 20ng/mL. The researchers concluded the study with the following statement: “This study indicates that vitamin D supplementation improves the severity of RLS symptoms and advocates that vitamin D deficiency is conceivably associated with RLS”. The majority of my patients are vitamin D deficient when I give them a blood test. It’s not difficult to be deficient; unless you are an outdoor worker or on holiday, you probably spend the majority of your time indoors. We need midday sun exposure in order to manufacture vitamin D in our skin, because midday sun contains UVB rays. If you have never had a vitamin D blood test, please ask your doctor. 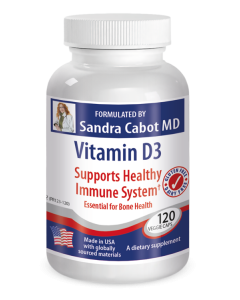 Along with sensible sun exposure, a vitamin D supplement is usually required.